Planting garlic is really quite easy! Here are some notes on selection and care for growing garlic at home. Garlic is such a valuable herb. If you like garlic it's perhaps not such a bad idea to grow some of your own. Garlic plants do not occupy very much space so this is perhaps a good reason to plant some for home growing. If you grow your own garlic plants you should no longer have to accept second best supermarket varieties for your culinary needs. You can grow your garlic plants organically and you can find a far wider ranger of types than will be available to you in ordinary greengrocers and supermarkets. "Wet neck" or "soft neck" varieties, for example don't store so well so you generally won't find them in the shops. But they are some of the best garlic plants to grow if taste is your priority. Planting garlic in your home patch is perhaps the best way to ensure you get tasty and organic cloves. The other way is to look for local garlic in farmers' markets. Elephant garlic is a popular variety and it certainly looks impressive. I find the taste is rather weak compared to smaller types and the cloves are relatively expensive to buy for planting. They are easy enough to grow. In fact, they produce a larger yield for the space occupied, so some people may find them a good choice. 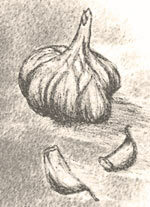 Elephant garlic is thought to be a cultivar of garlic originating in the eastern Mediterranean area. It was popularised by a nurseryman from Oregon in the 1940s. Garlic was a popular herb in Roman times and in Britain the Isle of Wight is still the foremost place for commercial garlic growing. Each year the island hosts a garlic festival which sounds fun - where you can attend cookery demos and sample garlic ice cream and other rarities. So what steps do you need for your own garlic planting heaven? The first and most important thing is to research a good source of garlic cloves for home planting. It is just no use relying on recycled, sprouted garlic cloves from your local supermarket. If they grow at all, they will almost certainly be small and distorted. One case where recycling does not do! Nevertheless, one of my neighbours claims to get good results doing just that - planting garlic cloves from commercially grown supermarket specimens, so I'll have to try this too. If you look online there are several reputable garlic farms which specialise in selling garlic for home planting. You can also buy your cloves for home growing garlic in the larger garden centres. Be careful. I've been fooled before now into parting with good cash for sub-standard stock, so now I make a few checks before I buy. Much of the seedstock on offer in catalogues is the relatively short lived types which will only store up to about Christmas. I believe you can buy good, inexpensive stock from France but I haven't tried this yet. 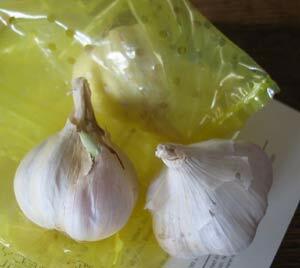 If the garlic cloves are packaged, it is best to open the packaging to have a look at the quality of what you are buying. If the packaging is see-through look carefully to see that the cloves show no signs of rot or shrivelling. They should be plump and firm. It does not matter if they are starting to sprout green tips. Packaged bulbs, found in heated shops and or chilly garden centres, can be dried up, withered or even suffering from actual rot! So take a peek - if the stock is sub-standard any garden centre will want to know. If the stock is plump and firm, then you can buy with reasonable confidence. Stock grown in the EU (Europe) is supposed to be certified disease-free. If you can, buy whole bulbs rather than just separate cloves. They are more likely to be in good condition. Keep them in dry but cool conditions. Break them apart only when you are ready to use them. You can plant garlic in autumn or early to mid spring. Most varieties will do better if left to overwinter. This is because the plant gets to develop a decent root system before the onset of harsh weather. If your soil is heavy they may do better in containers, as this is a plant which does better in light or sandy soil. Garlic lends itself quite well to container growing as the garlic plant - even when mature - does not take up much room. However you must allow enough soil depth. Planting garlic in old toilet roll inners is a trick you can use to advance your garlic during early spring before planting out. Half fill the rolls with soil or compost and put them in a frost-free spot. Push the cloves gently a little way into the soil. Alternatively start planting garlic outside in November while the soil is still quite warm. As garlic needs a long growing season, this can be a good choice. Plant garlic in soft soil when the temperature is not too chilly. Avoid planting them in soil which has been manured recently. Soil which was manured or fertilised for a previous crop is ideal. Plant your garlic cloves about 5 cms deep so that the pointed growing tip is below soil level. Each garlic plant will need to be at least 7 or 8 cms away from the next one. For the larger varieties allow 10cms or more (4 inches). If you plant in rows, then leave about 30cms (1 foot) between rows. Alternatively, you can sow them as a grid shape. For this, leave enough room between each garlic plant to fit a hand hoe blade. You need to ensure that your precious crop is not drowned in weeds, so a hoe's width gap makes life easier when the weeds start out-growing the young garlic plants. If you have too mild a winter some of your garlic may just grow into single large round bulbs. If this happens replant them next autumn and all should be well. Planting garlic which has formed a round bulb is a way to get extra large garlic at the end of the next growing season. You may need to water if the season is unusually dry. If you suffer a lot of wet weather in autumn or early spring you may find it's easier to start your garlic plants off under glass. The cloves can be sown in individual pots or in large multi-cells. This should prevent rotting due to bad weather. Garlic plants are otherwise quite easy to care for. Nematodes can be a problem, as can be virus infections. Slugs can attack young plants. Keep an eye on your garlic plants and root out any which appear to be diseased. In late summer or early autumn the garlic plant leaves will start to yellow. Harvesting your garlic plants is quite easy. Carefully pull each bulb up, remove excess soil and spread them out to dry in an airy, dry place. A wire rack is useful for letting them dry naturally and completely. If you can't find anything suitable, make sure you turn the garlic plants frequently to allow complete drying so no moulds can start their destructive work. When they are dry (several days, at least) either plait them together by their dried stems, or store them threaded onto a string or wire for hanging. Keep them somewhere cool but dry until needed. They can last for up to a year in these conditions. Planting garlic from your own harvested bulbs is an option but you may still need to buy new bulbs as vigour can be lost over a few seasons.